Grab Shot 32 - "Cascading Cups"
"My cousins and I were 'cup stacking' in the backyard," said Charles Zablan. 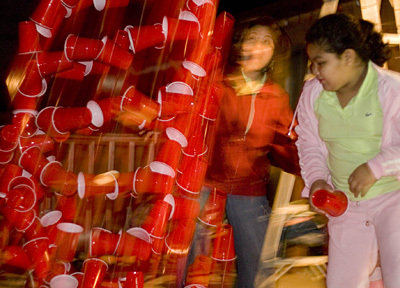 "I captured this shot of my cousin ripping one of the cups from our massive 15 foot tall stack. I loved the motion effect on the cups and the reaction on my aunt's face as she was startled by the loud crash of about 300 cups." The settings should be very familiar since it's from one of your shows! Thanks for all the tips my photography is 10 times better because of it, looking forward to the next one!